​What would happen if a group of high school stoners grew up and became the faculty at their own own high school? Austin High is now available across American Cable in Movies on Demand! ​What would happen if a group of high school stoners grew up and became the faculty at their own own high school? 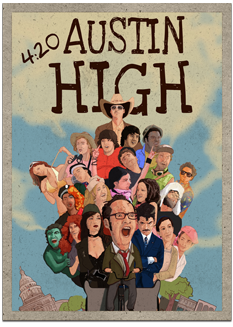 AUSTIN HIGH is an irreverent comedy that finally answers that age-old question. Fueled by the threat of a city-wide crackdown on marijuana, the story follows the adventures of the blazed staff of Austin High, and then travels far outside the school walls to chronicle a collection of very colorful (and very high) characters around Austin.